1) "Are enterprise-class drives just relabeled consumer drives?" It's surprising how often I get this question, in spite of major players like Google questioning the value of enterprise drives. For awhile, we didn't know the answer to that question for sure. From my customers' feedback, I definitely saw great potential within 45 Drives to start offering hard drives. It would be undeniably more convenient for them to purchase both a Storinator and hard drives (at the same time) in one order, especially at a competitive price. But before I could help the company decide what kind of hard drive to offer, there were a few questions we had to answer ourselves. Most of the Storinators out in the world today aren’t only being used for cold or archival storage; many are used for data-intensive applications like video or file serving in always-on environments. Our storage pods still provide data storage, of course, but now data is actively sent over 10GbE networks with more frequency than any previous point in our history. We set out to consult our community on their hard-drive choices and how they were working for them. 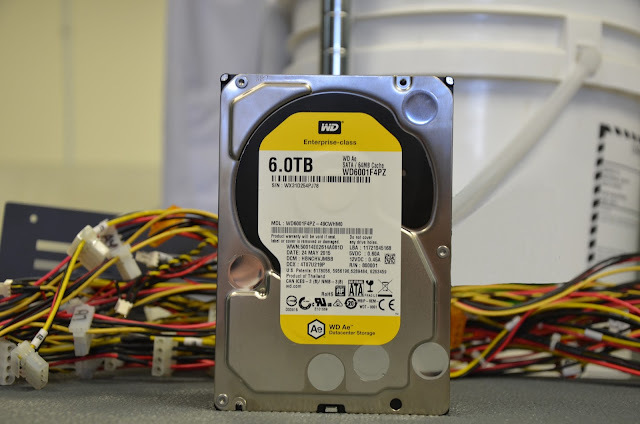 What we discovered is many of our customers are using consumer-grade hard drives (C-class drives from here on in), and the results from using such drives are mixed. We have customers who are replacing two and three drives a month, but on the other hand, we have customers who have the same set running for the last three to four years with no problems. It was puzzling why some customers reported no problems, while others had many failures. So we started asking questions and digging in. After many conversations, the answer slowly emerged. First and foremost, it was an issue of how much the drives were being used to read and write per year. Customers who intensively used the drives experienced many more failures than customers who used them for cold storage. Some of our customers who have intensive read/write applications even began exchanging the C-class hard drives with the enterprise-class drives (E-class drives), which solved their issues with drive failures. So this brings another obvious question, “Is there a problem with consumer drives?” All of feedback our customers have provided to us points to the following: C-Class drives work excellently in archival and cold storage applications, but as you move to more intensive data access and higher availability applications, E-class drives are a much better choice. Our experience within the 45 Drives R&D lab confirms the picture I painted above. We have about 250 enterprise class hard drives, along with 400 or so consumer-class hard drives in our R&D inventory. These drives are taken in and out of our test pods repeatedly, as they are used in a wide variety of experiments as part of ongoing pod application development. This causes considerable wear and tear, as you might imagine. Essentially, we've been carrying out an informal experiment that sheds light on the reliability of the various types of drives themselves. What we have observed is that, under the rigorous conditions in our lab, the failure rate on the C-class drives is very high. We are regularly sending back consumer drives that fail during the warranty period. Here’s where it gets interesting, in the last two years, since we started using E-class drives, we have not lost a single drive of this class. They’re now the favorite drives of our R&D engineers, and get handled more than the C-class drives. And whenever we build an array with these enterprise drives (from various manufacturers), they consistently work and are always stable (Remember, it only takes a single problematic drive to really slow down the syncing of a very large array). 1) Storinators are so economical, the hard drives are now a bigger cost than the storage pod itself. 2) Our direct wired design is so reliable, array stability is now massively dependent on drive stability. 45 WD enterprise-class hard drives in our R&D research lab. So, we believe, with the exception of customers who are strictly doing archival cold storage, a Storinator storage pod stuffed with E-class drives will deliver a much more satisfying experience. Odds are excellent that once you've fully configured your arrays and are up and running, that your machine will continue to do so for years to come. So, in the end, our decision to offer E-class drives is based both on feedback from our customers, and our own experience in the lab. E-class drives match the durability and stability of our Storinator storage pods, especially for higher-availability applications. This, in turn, makes our customers more successful in their data application requirements, and they keep coming back to us! Two more posts coming soon to the blog from yours truly: 1) why we chose to offer WD Enterprise-class drives, and 2) how we distinguish between cold and live data storage.